These beautiful feathers came from a road kill White-fronted Parrot (really they did!) near Nuevo Arenal. White-fronted Parrots are pretty common in these parts, and they get together in a grove and all talk at once. Go to the "Sounds List" page for more samples of this bird's complex vocalizations. Parrots and Parakeets live everywhere in Costa Rica. They range in size from the two species of Macaw down to the 6" Barred Parakeet. Parakeets are just small parrots, often with longish tails, and are not the same as what you had in a cage as a child, which was probably a Budgerigar, from Australia. Parrots and kin are never discreet - you always know when they're around by their rambunctious squawking. Listen to several on the Sounds List page to hear that not all squawks are created equal! 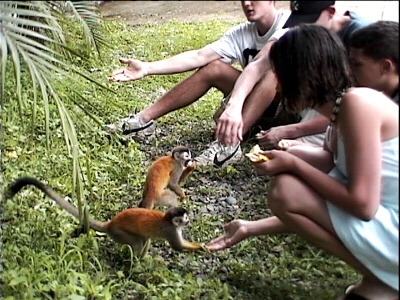 Here the kids are feeding Squirrel Monkeys my breakfast of bananas. The kids are on the right. 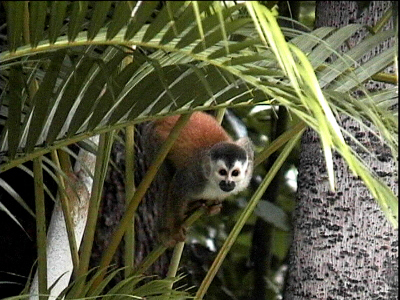 Squirrel monkeys are very common, especialy around Manuel Antonio, where this was taken, and they make a real screeching racket when they show up! Here's a better picture of one of these fun little guys. They are the world's best jumpers! They can make leaps of ten or twenty feet, ofseemingly effortlessly, and land on a thin palm leaf with a baby on their back!